CES is more popular than ever -- according to its sponsors -- despite naysayers who predicted doom for the mammoth trade show after Microsoft said it would drastically scale back its participation following this year's event. 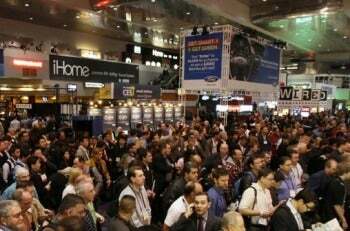 The 2012 International CES had more exhibitors (3100) hawking their wares across more space (1.9 million square feet) and attracted more people (153,000 attendees) than any other CES in the 44-year history of the event, the Consumer Electronics Association revealed in a statement released Friday. In addition, more than 20,000 new products were introduced at this year's show, the association said, and more than 2000 news articles were written about innovations at the event -- a 33 percent increase over 2011. One of the chief criticisms of CES is that it has lost its focus -- that it has become too big to be of much value to many companies. However, it seems that the size of the show and its ability to attract exhibitors from many industries may be exactly what will make the show shine in the coming years. "We are witnessing the promised road of convergence with CES as the ringleader," IBM Managing Director Scott Burnett said in a statement. "Devices are talking and many different industries are listening, beyond electronics: media and Internet, energy and utilities, telecommunications, automotive, health and well-being companies are migrating to this show," he continued. "Truly a social media of connected devices is forming, with CES 'friending' industries," he added. Microsoft's announced withdrawal from CES after this year provided a juicy bone for the dogs of doom. But those hounds aren't anything new to CES, and they'll always be there as long as there's uncertainty and change in the consumer electronics industry. Certainly, Microsoft had its reasons, both public and private, for its decision. But it can't be denied that CES is no longer an event dominated by computer and software makers. Technology is everywhere and in everything and the show reflects that. Microsoft's decision may reflect that, too.